for this Grade-4 jobs through official website of www.banka.nic.in. Candidates selection will be based on merit in Matric or 10th class marks for this Banka District Grade 4 posts. Submit application form in a prescribed format to Banka Collectorate before the closing date of 31-01-2019. Last date to submission of application form for these Grade 4 vacancies is 31-01-2019. There are total 138 posts are in this Grade 4 jobs. Lower age limit is 18 years for all the posts. Upper age limit for General Male is 37 years, Gen Female is 40 years, For BC /MBC candidates 40 years and for SC/ST 42 years. 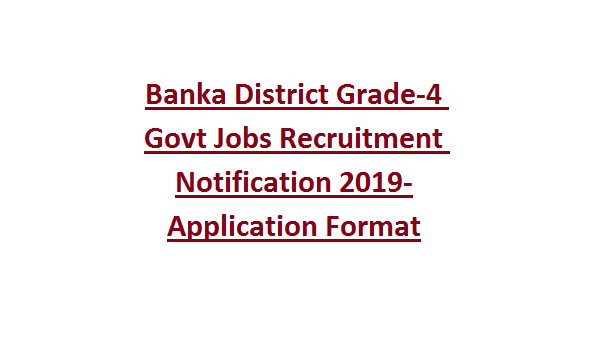 Matriculation qualification is required for this Banka district Grade 4 posts. Based on merit in 10th class marks or written exam candidates will be selected for this Grade 4 posts. 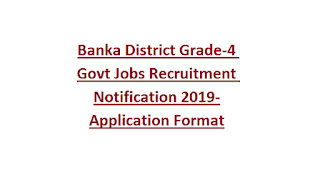 Submit application form before the closing date of 31-01-2019 to Banka District Collectorate. Application form is available to download at www.banka.nic.in. Note: Prepare the application form in the same format. Fill the application form with your own hand writing.